When you visit ArrowOutlet.com, the auction clock you see in your web browser is only accurate to plus or minus half a second. Therefore, for example, when you see 1 second remaining, the actual auction time remaining on ArrowOutlet's server clock is unknown to you and is between 0.5 seconds and 1.5 seconds. *[See technical details here]. This limits how accurately you can place your bids. If you try to bid when exactly 3.00 seconds remain, your bid will actually be placed with 2.5 to 3.5 seconds remaining. To the right is user ldbaro's Bid Histogram. It shows how many actual seconds remained when ArrowOutlet received his 4,214 bids. This histogram is simply 120 vertical blue bars placed side by side. 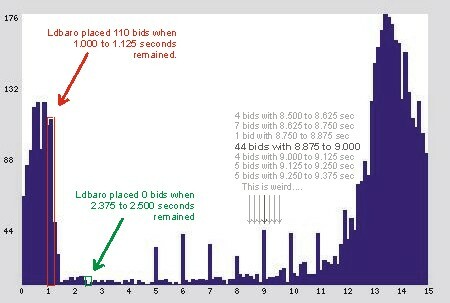 Each bar indicates how many bids were received from ldbaro within a specific 0.125 second time interval. For example, the bar with the red arrow shows that ArrowOutlet received 110 bids from ldbaro when 1.000 to 1.125 actual seconds remained. If a bar is absent, then ldbaro didn't place any bids in that 0.125 interval. For example, the bar for 2.375 to 2.500 seconds is absent (the green arrow). Notice all the tall bars near 1 second and 14 seconds. These show that ldbaro placed most of his bids either immediately after another bidder (around 14 seconds) or when the auction might end (around 1 second). If you add up the combined heights of all the bars present, it will equal ldbaro's 4,214 bids. Here are the histograms of 16 more users. Do you notice anything strange? Wow, so many users bid when precisely an integer amount of actual seconds remain and never in between! For example, they bid when 4.00 actual seconds remain but never when 3.88, 4.25, or 4.9 actual seconds remain!! These histograms are impossible for a user to obtain using the clock and Bid Now button on ArrowOutlet's webpage (as explained above). Also, it is impossible for all these users to consistently bid when exactly zero actual seconds remain and never when 0.01, 0.25, or 0.66 seconds remain. Bidders 1, 3, 4, 6, 7, 9, 10, 13, 15, and 16 are robots. Bidders 2, 5, 8, 11, 12, and 14 are humans. Bidder 8 is a human using the Bid-O-Matic feature. If you set the webpage's Bid-O-Matic to bid for you, each time you are not the current winner, ArrowOutlet will choose a random integer from 5 to 15 and place a bid for you when this much time remains. As a result, your histogram shows bids placed at exactly 5, 6, 7, 8, 9, 10, 11, 12, 13, 14, and 15 actual seconds remaining. The above histograms show that Bidder 8 uses the Bid-O-Matic most of the time and bidders 2, 12, and ldbaro use it sometimes. (Human bidders 5, 11, and 14 never use it.) The Bid-O-Matic is the only way available to consistently bid when exactly integer seconds remain. Note that the Bid-O-Matic never waits until less than 5 seconds remain to bid. Since 100% of the bids from Bidders 1, 3, 4, 6, 7, 9, 10, 13, 15, and 16 are placed with exactly integer actual seconds remaining and 75% of their bids are placed with less than 5 seconds remaining (at integers 0, 1, 2, 3 and 4), this implies they are not using ArrowOutlet's only 2 methods to bid, the Bid-O-Matic or the Bid Now button. Also, amazingly, 25% of their bids reach ArrowOutlet's server when precisely 0.00 actual seconds remain. There are 3,000 bidders exhibiting this same strange and amazing behavior. These bidders are robots and not humans. of users who placed 250 bids or more. Click a letter.